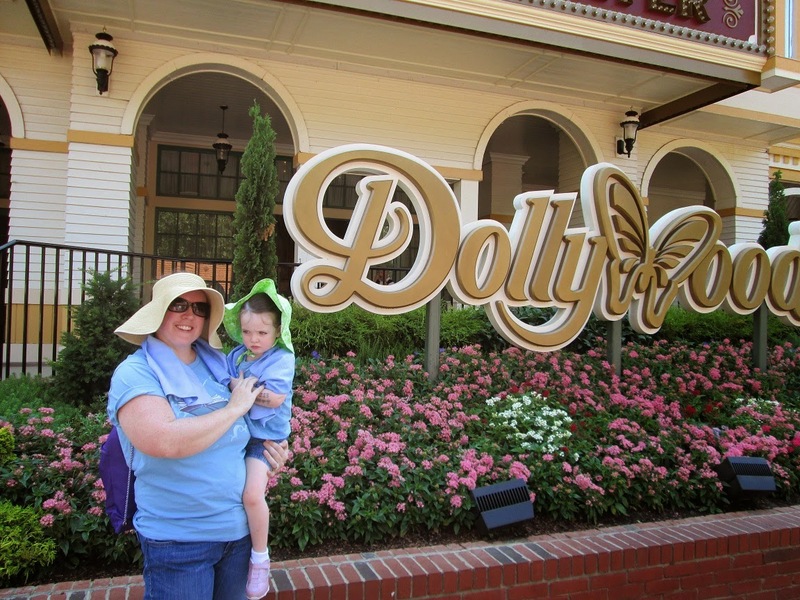 The highlight of our trip to Tennessee last week was our two days at Dollywood. We bought a three-day, two park pass that included Splash Country. Jane was free because she's under 3, but it was still ridiculously expensive. We probably could have saved some money buying the tickets online even with the $16 processing fee. Live and learn. Also they say no outside food, but they don't check your bags (makes you wonder about security actually). I brought in some snacky foods for Jane but otherwise abided by the rules. The first day we had Jane measured at the Central Measuring Station near the Showstreet Fountain. 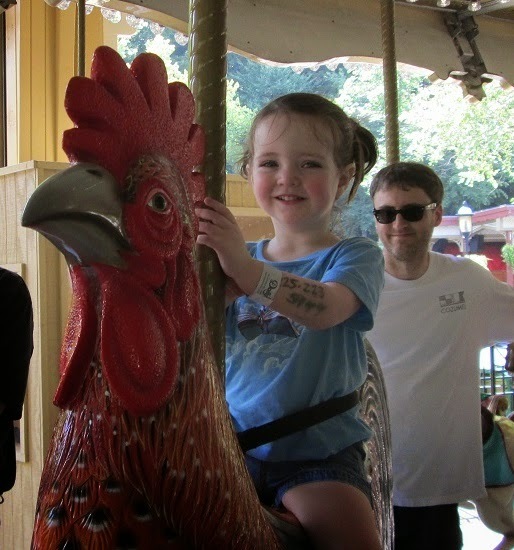 It was a good thing because it showed us which rides she could ride on (not that we would have attempted to let her ride on any she was too short for). But we also had her measured the second day, which was wholly unnecessary and actually wasted time that could have been spent riding on one or two rides. We arrived both days pretty soon after the park opened, so the lines were long for things like measuring and rides closest to the front of the park. If you ask Jane now what her favorite part was, she'll say "the trolley," by which she means the tram that carried us from the parking lot to the front of the park. Silly girl! She did a lot of things while at the park: the Scrambler (she was way too small and it was too scary), the Lucky Ducks, the Busy Bees, the Piggy Parade, the Carousel (probably her real favorite, including getting to ride a chicken like Skeeter from the Dixie Stampede show), the Dollywood Express coal-powered train and the Rockin' Roadway cars. We watched several shows, including two from the Imagination Library that were short plays based on children's books. Ladybug Girl and Bingo was our absolute favorite, and I think we should have gone to see it again. I bought her a copy of the book, and we've read it so many times I think I know it by heart! We'll definitely be checking out others in this series. We also saw One Cool Friend, which was good but not as good. We also really like the "I Am a Rainbow" theme song that's played at every Imagination Library show. In our two days there we didn't even make it to the play areas. There's a playground and at least three water fountain/splash pad-like areas for kid play. And there were other rides she was big enough to try, although she was too scared of the Flying Elephants and we got rained out for the River Battle one. Both days I was packing her bathing suit, swim diapers, change of clothes and beach towel, but she didn't get wet either day (aside from some torrential rain just before we left for good -- we took shelter during a magic show so only our stroller got completely drenched). My favorite part of the park was the Ladybug Girl and Bingo show, but my favorite ride was the Mystery Mine. I got to ride several roller coasters, because Shawn and I were able to go to the park sans toddler on Sunday afternoon. (Turning our three-day ticket into four days effectively because if you go to the park after 3 pm your next day is free.) I hadn't been to an amusement park since college, when I went to Frontier City with a friend and we wrote about it for our college paper. (I was able to find it in the archives but not an easy way to link to it. A little too embarrassing anyway, but fun.) I'd forgotten how awesome roller coasters are. Wheeeee! Gatlinburg and Pigeon Forge were great for a family vacation, and there was plenty for a toddler to do. Everything is quite touristy, but not in a bad way ... especially when you're a tourist! I'm not sure if we'll go back, although Jane is already talking about how she'll be bigger when we do go back and she will want to ride on the Flying Elephants. Note: Some Amazon affiliate links used. This post encouraging mamas to put on their swimsuits and play with their kids has received a lot of attention. I think it's a great message, and I tweeted it too. But I kind of hate that it's even necessary. Of course we should swim with our kids, and I don't think I've ever hesitated. I am all for moms (and grandmas and dads and grandpas, etc.) having fun with the kids and especially eschewing any negative body image feelings during play time. But I also have never been thin, so I think putting on a swimsuit isn't some huge effort for me -- no more so than putting on a swimsuit before having Jane might have been. I can't relate to the moms who have memories of strutting their stuff in tiny bikinis. That's just never been me. I've never been thin, although I was probably a regular sized kid. Compared to my very skinny boy cousins (who are 2 and 4 years younger also) I was gargantuan ... at least until they grew well over six feet (and I probably still weigh more than them). I've also always been bigger than my sister. Anyway, I have a distinct memory of watching myself in a bathing suit as a ~10 year old -- a video my uncle had shot during one of my sister's swim party birthdays. We were watching it together, and I remember cringing ... and feeling that my body was gross or not as cute as the other, littler children. I don't know if anything was actually said when I was onscreen, so this could have been all in my mind and something that I figured out by the media images of "good" bodies, but UGH. I don't want Jane to feel that way, no matter what her body looks like. I want her to recognize her body as something good and strong. And I want to feel that way about my body too. My body is pretty healthy and is definitely strong. It made a baby who has turned into my favorite girl ever! I have work I can do to strengthen my body and prolong its usefulness. I do that with varying success. And because I can wear a bathing suit without too much effort doesn't mean I don't have body hangups or care deeply about what other people think of me and how I look. But I want to love my body in a way that shows Jane she can love her body too. And that includes putting on a swimsuit (and sports bra!) without making it into a big thing. 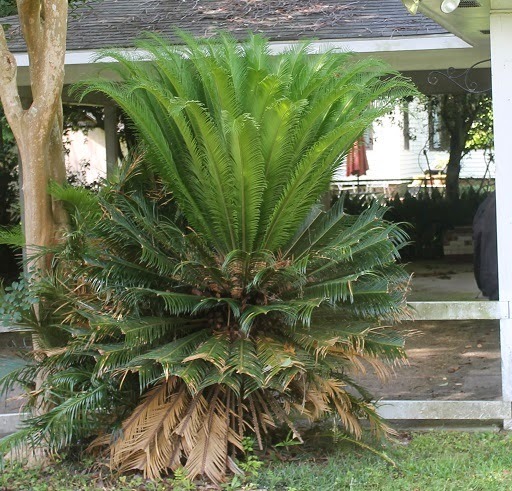 Here's what the palm plant looks like after I trimmed away all but the latest growth. 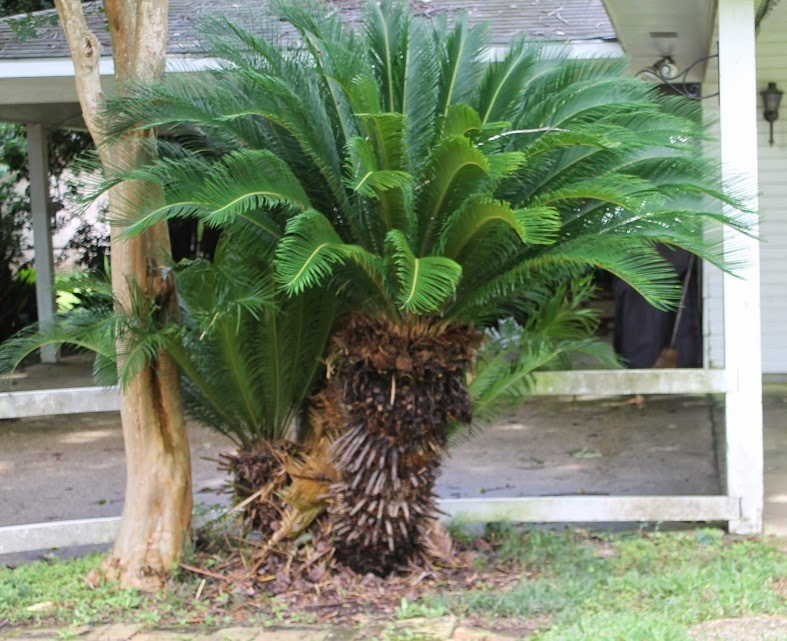 I'm sure professional gardeners could sheer even closer to the trunk. Whatever the case it's a major improvement over the previous look. 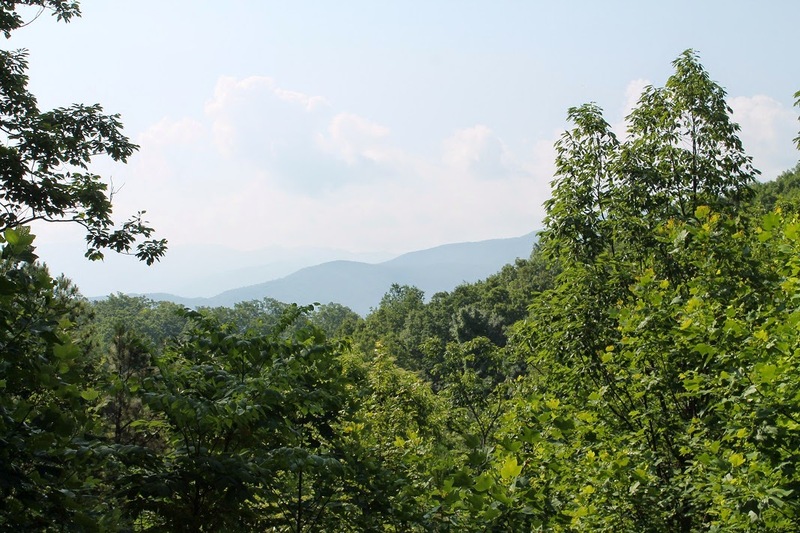 We just came home from a week in Tennessee, and here is what our view was from the cabin's back porch. It was lovely, and we had a great time. There are a lot of stories that I want to write. For now I'm just adjusting to getting back and catching up. 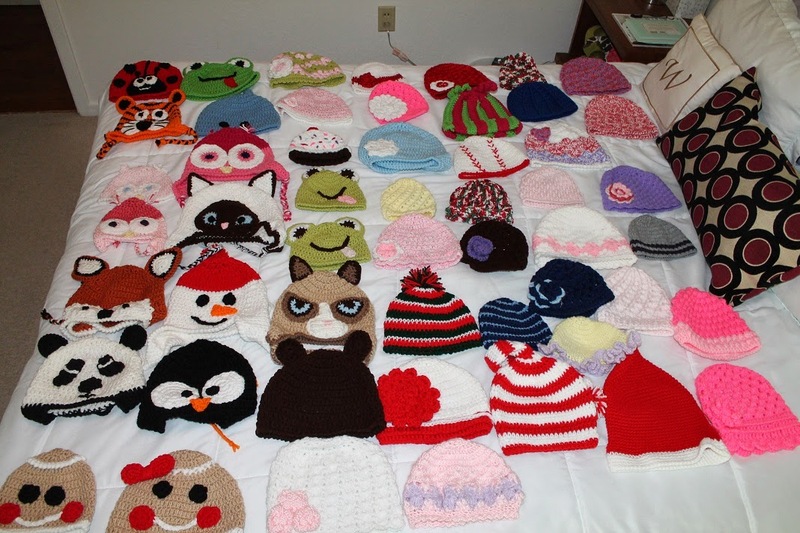 When I made hats last Christmas for many of the toddlers in my life my aunt mentioned that she could probably sell them at her work's craft fair in the fall. After I worked on some crochet blankets in the first of the year I started to work my way through my stash of yarn and have ended up with about 50 toddler- and baby-sized hats (and bought more yarn because I can't seem to stop). There are so many hat ideas, and each one takes me just a few hours to make. The character ones take the longest because of the small pieces and sewing them in place (sometimes having to redo them placement because I'm not happy with my first try). I'm not sure that I can actually find buyers for any of the hats -- or how I'm going to stop myself from making more. Hrm. I had never thought of this until I saw a lifeguard at Jane's water exploration class wearing a neon yellow sports bra under her red lifeguard suit. It looked cute, but also was an "Aha!" moment. Bathing suits that fit me never have enough breast support. And I knew if I was going to try the aqua aerobics I would need it! When I workout in our sun room I double up on sports bras, and I still sometimes have too much bounce for comfort. 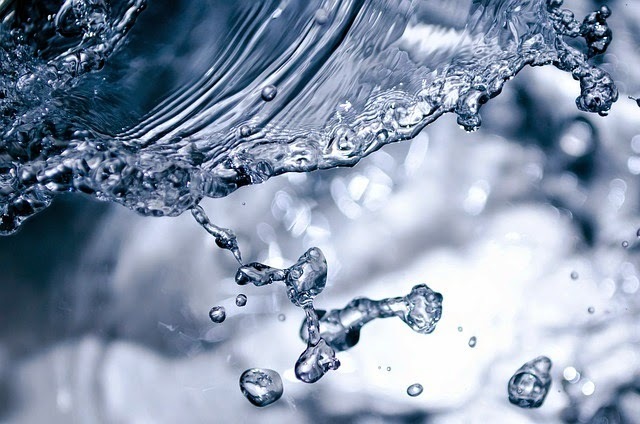 In the water one sports bra and bathing suit plus the water has proven to be enough for me to be comfortable and not worry about wardrobe malfunctions or nip-slips. The sports bra does smell chlorine-y like a swimsuit, although I'm sure a few washes will cure that (or I can just have water-only bras if I cared about how I smell). From now on every time I swim or play in the water I'll be sporting a sports bra underneath. The night before the start of the water exploration class I was a nervous wreck. Anxious was an understatement. I worried about whether there would be traffic on the way to the water park, if I would miss my alarm and sleep too late, if Jane would eat her breakfast, if we'd have time for everything. I was also VERY worried about how Jane would take to being in the water without me, even though we had discussed it from the day we signed up for the class. Jane is two and a half, but we're still very much a unit in a lot of ways. She was upset, and even though I had been anxious about it and worried, I somehow hadn't steeled myself for the rush of separation anxiety I got when she had to go. It took about three tries that first day, but we separated when it was time to get life jackets. She DID want to get in the water and have fun, but she didn't want to do it without me. Every day got a little better, at least in that I didn't cry myself after that first day. Jane didn't toddle off to class of her own accord and was always handed off, panicked look on her face and crying, to one of the extremely patient and kind lifeguard teachers. We are certainly a memorable pair! It's not clear to me what she's learning, although she has talked about big kicks, and I've been able to see her being pulled around in the water some while she floats on her back. All the parents are made to sit on benches on the other side of a giant water feature so the kids won't be distracted. I hate it and absolutely agree with it at the same time. At the same time as the water exploration and swim classes (for older kids) there is a water aerobics class that was plugged for the parents. I didn't want to pay $45 for just a few classes, because realistically I can't come any time other than when Jane is exploring the water with the other kids and lifeguards. But after I checked their website and saw you could pay $5 per class I decided to give it a go. It would also let me save time and knock out my workout for the day. Unfortunately it also gives me a better look at Jane's class, and she's able to see me sometimes and she does get distracted and sometimes even wanders off on the edge of the pool. Scary to me, and not good for her. But oh, she is adorable in her bathing suit and life jacket lined up with the other kids. I love the aerobics class. It's mostly older ladies, although there is one teenager and a few women my age or so. The water makes the hard work feel easier, although at the end I'm sweaty and red faced, and I definitely get my heart beat up. My favorite challenge is when we have to take turns sprinting into the jet made by the giant water slides (the class is in the pool where they land). It's so difficult and so fun. I also love the mindless class aspect -- someone tells me what to do and I do it. It's a big reason why I like the workout videos I have been doing too. I'm sure I would really love regular aerobics/exercise classes too. Child care is my sticking point though. So there are pros and cons to the water aerobics, but I intend to do the class three more times next week. Jane has four more sessions, but the last one they said we could get in the water with the kids to see what they have learned, so I'm looking forward to that! The other really hard thing about this experience has been the wake up time (and getting Jane up before she wakes up naturally). I have to be up by 6:15 to get everything done so we can leave by 7:25 and get to the water park by 7:45 for the 8 am class. I HATE to be late and leave time for traffic too -- so far we have been lucky and we get there by 7:40 and end up sitting on a bench and waiting anyway. I know it's a routine I could get used to -- and will have to when school starts and everyone needs to get places on time -- but I'm glad this is temporary and that tomorrow we get to sleep in (a little at least)!